A 23-year-old male, came with a recurrent swelling in the left gluteal region since 3 years. It was associated with pain, tingling, and numbness around the swelling and of the lower extremities below the knee. There was no history of trauma. The magnetic resonance imaging showed a large soft tissue mass in the left gluteal region extending into the proximal and posterior compartment of thigh with extensive involvement of sciatic nerve and erosion of left pubic ramus [Figure 1]a. Based on the radiologic impression of a soft tissue sarcoma, patient was administered chemotherapeutic drugs. The patient underwent resection of the mass in his hometown but presented again 6 months later with increase in the size of the mass. An incisional biopsy of the mass was performed at a referral center was suggestive of tumoral calcinosis. Biochemical investigations revealed serum levels of phosphorus and calcium to be 7.0 mg/dL and 9.5 mg/dL, respectively (normal range for serum calcium – 9–11 mg/dL and for serum phosphorus – 4–7 mg/dL). He was administered a single dose of Zolendronate following which the serum levels of phosphorus and calcium were 4.8 mg/dL and 8.6 mg/dL, respectively. He was then referred to our hospital for further management. There was no contributory family history or history of hemodialysis and the patient was overall in good health. Serum alkaline phosphatase levels were 328 IU/L (normal range 44–147 IU/L). At our hospital, the gluteal mass was surgically debulked and sent for histopathology examination. We received a large ill defined skin ulcerating lesion measuring 30 cm × 28 cm × 14 cm. The cut surface was grey white solid-cystic in appearance and had free flowing necrotic milky material. There was no rim of normal tissue at the periphery [Figure 1]b and [Figure 1]c. The histopathology showed extensive dystrophic calcification surrounded by foreign body giant cell reaction, fibroblastic proliferation, necrosis, hemosiderin pigment deposition, and mononuclear cell inflammation [Figure 1]d,[Figure 1]e,[Figure 1]f. There was ulceration of skin and infiltration of muscle. Inspite of extensive sampling there were no atypical cells or an increased mitotic activity. A histopathologic diagnosis of tumoral calcinosis-hyperphosphatemic type was given. The patient is doing well 5 months post operatively without recurrence. Tumoral calcinosis is a rare benign lesion first named by Inclan et al. in 1943. The exact etiology is unknown. However, different hypothesis have been postulated for its pathogenesis. Three subtypes have been described: (1) Primary normophosphatemic tumoral calcinosis (sporadic). (2) Primary hyperphosphatemic tumoral calcinosis (familial). The pathogenesis in this variant is a defect in the phosphate resorption. (3) Secondary tumoral calcinosis which is secondary to diseases like chronic renal failure with concurrent hyperparathyroidism, hypervitaminosis D, and milk – alkali syndrome. Due to the abnormal phosphate levels and multiple recurrences, our patient would fit into the second type though there was no contributory family history. Interestingly, tumoral calcinosis has been associated with vitamin D deficiency in an occasional case thereby supporting the hypothesis of a primary renal tubular defect. The typical presentation of the disease is a small-sized firm to hard mass in the subcutaneous plane usually juxta-articular but rarely involving the joints and commonly seen around the hip, shoulder, and elbow. Occasionally, however, large size can be attained leading to compressive symptoms, pressure necrosis of underlying bony surfaces, and skin ulceration as happened in our patient.,, When the lesion is large, it may be mistaken clinically for a malignant neoplasm like synovial sarcoma, chondrosarcoma, or an osteosarcoma. The grey white necrotic areas and the large size seen on gross examination may further favor a neoplastic lesion even pathologically. However, the free flowing opaque milky white chalky material favors a diagnosis of tumoral calcinosis. A biopsy diagnosis may be achieved when a soft tissue neoplasm is suspected. 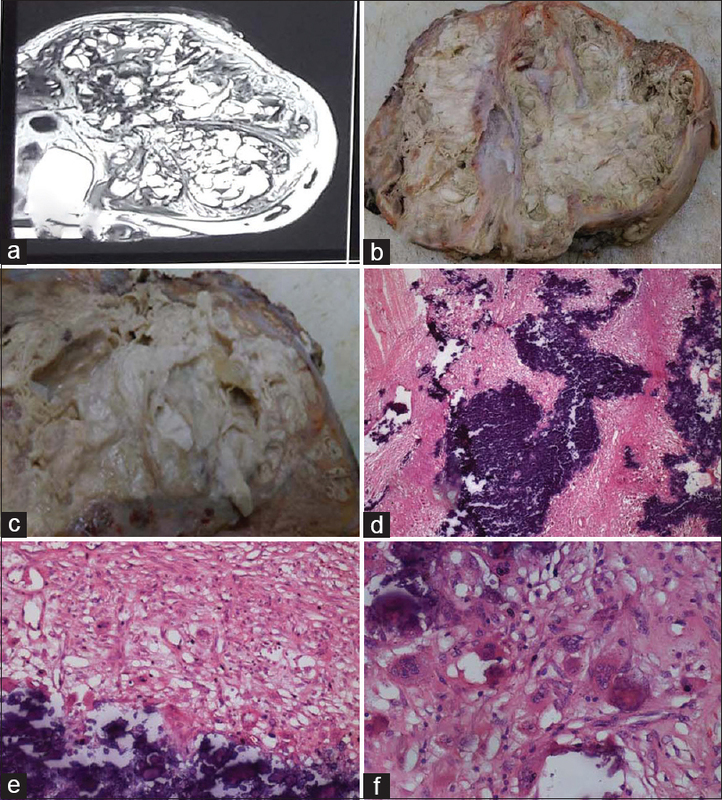 The characteristic histologic feature of amorphous calcified material surrounded by foreign body giant cell reaction and fibrosis distinguishes it from other causes of soft tissue calcification and neoplasms. The histopathologic features however, do not help to differentiate the three subtypes. To conclude, huge tumoral calcinosis requiring surgical treatment are rare and should be remembered in the differential diagnosis of recurrent calcified soft tissue lesions mimicking malignancy. Also, correlation with biochemical parameters helps in classifying the lesions thereby helping the correct management. Lin YP, Chen CH. Huge tumoral calcinosis of the buttock. Formosan J Surg 2014;47:23-7. Kannan S, Ravikumar L, Mahadevan S, Natarajan M, Satya A, Bhat R, et al. Tumoral calcinosis with Vitamin D deficiency. Saudi J Kidney Dis Transpl 2008;19:960-3. Mohamed S, Jong-Hun J, Weon-Yoo K. Tumoral calcinosis of the foot with unusual presentation in an 11-year-old boy: A case report and review of literature. J Postgrad Med 2007;53:247-9. Shaukat YM, Malik EF, Al Rashid M, Cannon SR. Large tumoral calcinosis in the gluteal region: A case report. Ortop Traumatol Rehabil 2013;15:495-9. Lykoudis EG, Seretis K, Ristanis S. Huge recurrent tumoral calcinosis needing extensive excision and reconstruction: Report of a rare case and brief literature review. Aesthetic Plast Surg 2012;36:1194-7. Liu X, Hong S, Chen G, Tu C. Large tumoral calcinosis and pathological femur fracture in a hemodialysis patient with secondary hyperparathyroidism. Int Surg J 2015;2:91-4.